St. Patrick's Day doesn't really do much for me. I look terrible in green, don't drink, and am a vegetarian so the corned beef is out (although when I was little and did eat meat I remember quite liking corned beef) and most of all, the day only serves to remind me of all the Celtic brick walls in my family tree. I have several Celtic lines in my family tree, but couldn't tell you where in Ireland or Scotland any of them lived. Below are my Celtic connections (mostly Scottish). Hopefully I'll find something on these families someday, maybe then I can enjoy St. Patrick's Day a little more. Montgomery and Wood: Jane Montgomery married Charles Wood, and they supposedly lived in the Edinburgh area of Scotland. Son Charles Wood was born in 1842. The family also lived in Ireland for a time, though I don't know when or why. Son Charles Wood came to Ontario Canada, possibly with a brother and married Didame Beam. They lived in Jackson Co., Michigan and then Canada again and finally Isabella Co., Michigan. Their daughter, Marion, was my great-great-grandmother. Allen: Joseph Allen was born in Scotland (sometimes he says Ireland on documents) around 1824. He came to Pennsylvania and married Elizabeth Clemmens around 1850. Family legend says this is an old Scottish family with ties to clan McKay. There was also supposedly a Thompson ancestor who married into the family in Scotland too. Clemens/Clemmens/Clements/ Clemments: Elizabeth Clements/Clemens (most frequent spellings) was born in Ireland around 1824 to James and Mary (unk.) Clemens. She had at least a brother, John, who was in the Civil War and a sister Jane (or May or Mary) who disappears after 1860. The family came to Pennsylvania, probably in the 1840s and settled in Lawrence Co. They lived in Shenango and New Castle. Elizabeth married the above, Joseph Allen and they were my great-great-great-grandparents. They lived in Lawrence Co., PA as well as Pittsburgh before settling in Trumbull/Mahoning County, Ohio in the 1860s. Doyle: All I know about this is that on the 1880 census, my greatx4 grandfather, Heman Doyle, said that he was born in Vermont to a father from Ireland and a mother from Connecticut. Heman was born 31 Dec 1809/1811 in Vermont. He married Alzina Jackman and they had three daughters and lived in Rochester, New York before the California Gold Rush. Heman came west with John R. Shinn and while John went back east to marry Heman's daughter, Heman stayed in California. He was the first District Attorney for Douglas Co., Nevada and was also a prominent lawyer, justice of the peace and judge in El Dorado and San Joaquin Counties. Heman died in 1881 and is buried in Woodbridge, California. So those are my "Celtic roots." Maybe someday I'll be able to find out more about them and where they lived in the "old country." 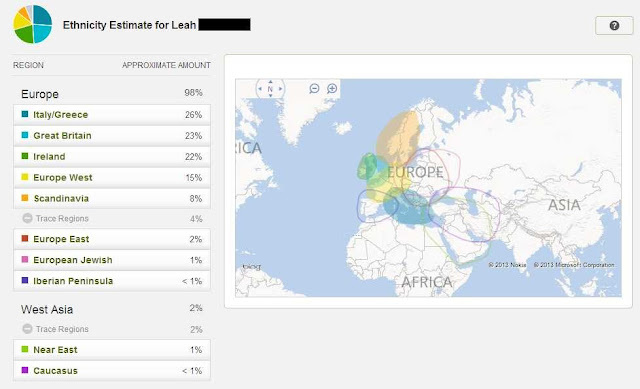 I sat down and calculated it and while my maternal Doyle line is too far back (I am 1/64th Irish from that) to really amount to anything in my "heritage pie," my father is 3/16ths Scottish/Irish which amounts to a little over 1/8th or a little less than 1/4 depending on how you want to look at it. So... that would make me a little over 1/16th or a little less than 1/8th, depending on how I looked at it.